One of the goals of CarolinaOA.com is to share the stories that are so obscure that people in that lodge or council might not even know. I've got one of those for you today but first you have to go back about 15 years to the reign of terror. 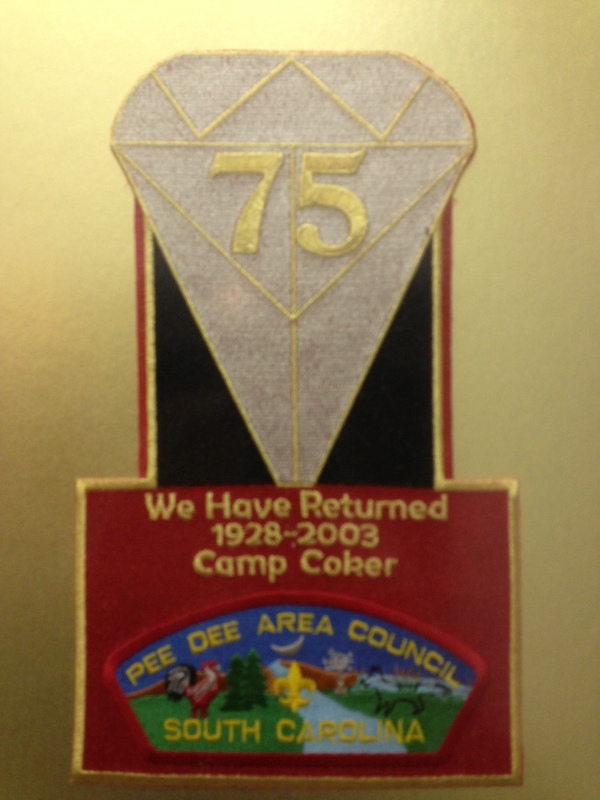 During the late 1990s the Pee Dee Area Council was led by a Scout Executive that many would still blame for the ills troubling the rural Scouting movement headquartered in Florence. Jim Head was from New Mexico and he did not take to the old guard and traditions of folks from this unique little lodge. To list the numerous ways that he butted heads (pun intended) with the youth and adults of those days would take a lot of ink. Instead let me share one story that kinda illustrates his arrogance. 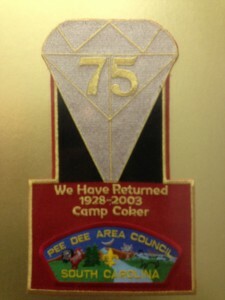 Mr. Head decided that in 2003 the council would hold a Camp Coker staff reunion weekend. 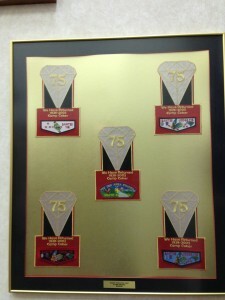 He had a patch ordered for the event and made plans to turn it into a fundraiser for the council. With the price set at $240 for a weekend reunion the plans fell apart completely. 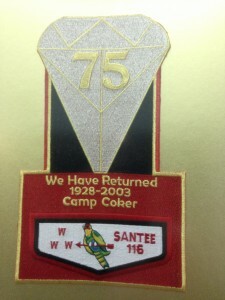 It was during this time that he also decided to make a set of patches that would be auctioned off at the reunion. 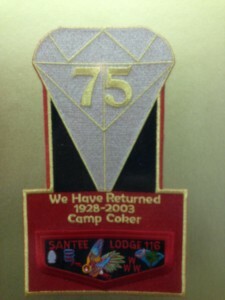 He took the council strip and the four lodge flaps that were current to the time and had a special issue jacket patch made. There were made as one off samples although he ordered them from two different patch companies (I believe Stadri and Moritz). 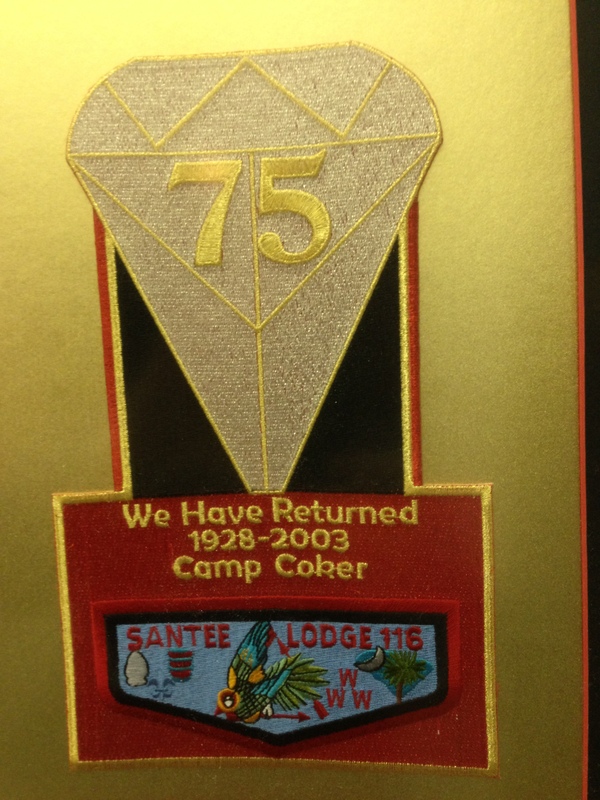 Once the event fell through he eventually mailed out the regular sized patch as a "thank you" in a note to all the lodge members who served on the staff at the 2003 Dixie Fellowship. One of the framed sets of the jacket patches now rests in the council office in Florence. The other set I am a little fuzzy about it's whereabouts. 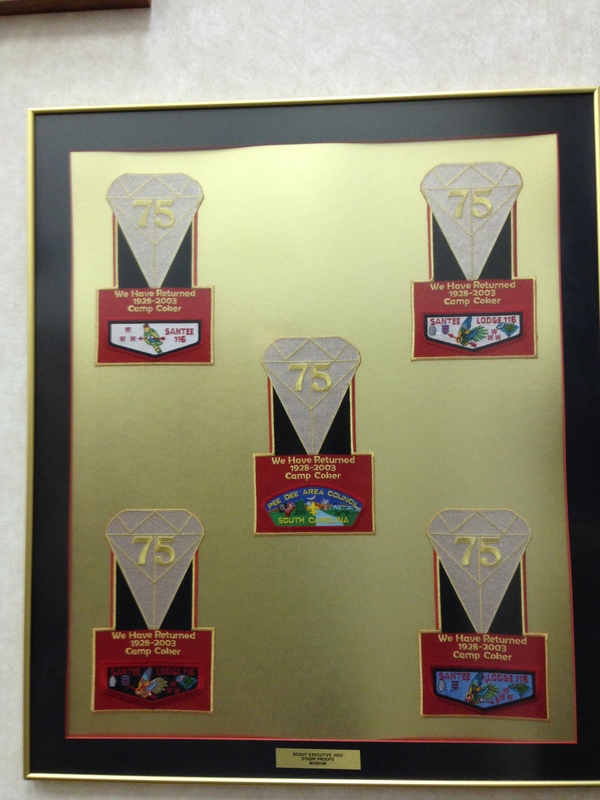 It was either taken by Mr. Head as a parting gift when he left the council or it might be that he handed out pieces of the 5-patch set to key leaders. I will try and research this more and confirm. At any rate these patches are not listed in Blue Book, on OAimages.com or any other location. 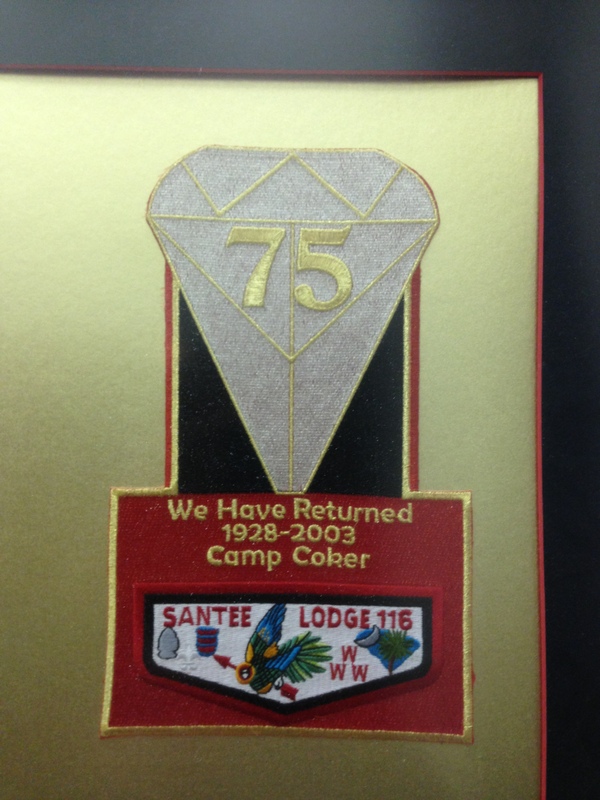 They were ordered by the Chief of the Fire for his own personal project and the lodge never had anything to do with them. 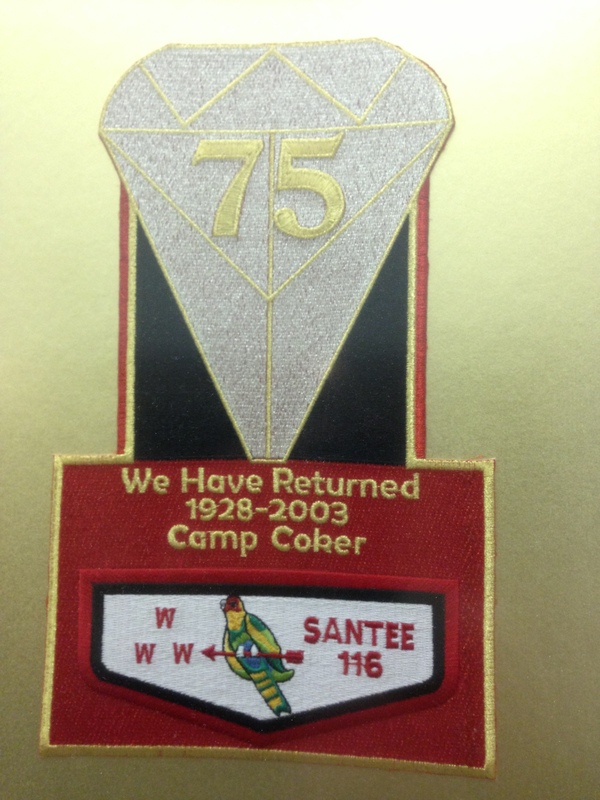 Does the “75” denote the 75th anniversary of Camp Coker? 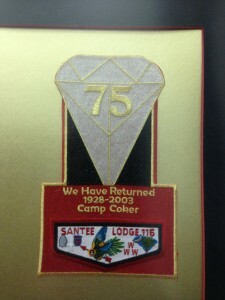 Yes 2003 was the 75th anniversary of the camp and council.